Mark your calendars! 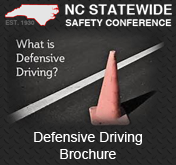 The 89th Annual NC Statewide Safety Conference will be held May 13-15, 2019 at the Joseph S. Koury Convention Center in Greensboro, NC. 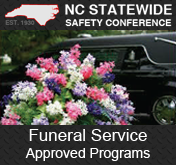 Offering First Aid/CPR/AED, Water & Waste water, Health & Safety, Funeral Service Approved Programs, Accident Prevention and more. 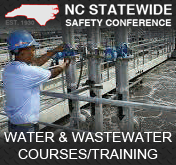 Get the latest updates on all of our Courses, Events, and Important Safety Information! We do not sell attendee list. We will never use a 3rd party vendor for attendee registration. As always the attendee list is included in the price of your booth at no additional charge. 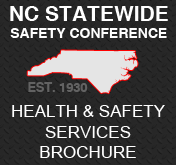 Thank you for your support of the 2018 NC Statewide Safety Conference! 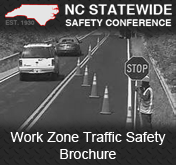 The 89th Annual N.C. Statewide Safety Conference will be held on Monday May 13th - Wednesday May 15, 2019 at the Joseph S. Koury Convention Center in Greensboro, NC. Stay tuned for 2019 changes! 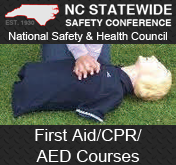 You may enroll in the complete First Aid/CPR/AED course or you may enroll in either the First Aid or CPR/AED only course. The choice is yours! 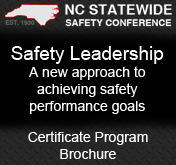 The NC Statewide Safety Conference, Inc. offer a wide variety of Workshops for industry, business and government agencies. 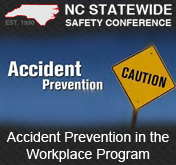 These workshops are intended to assist your funeral home in reducing accidents and lowering your Workers’ Compensation costs. 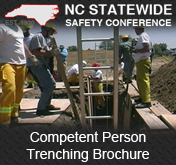 This workshop is intended for what OSHA calls a “competent person”—that is, a person who is knowledgeable about trenching operations. 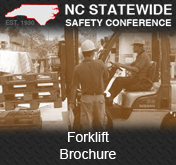 This certificate-level Forklift Operator safety training program focuses on the safe operation of a sit-down, counterbalanced forklift. Whether you drive on the job or just to and from work, motor vehicle safety is an important part of your workplace safety.